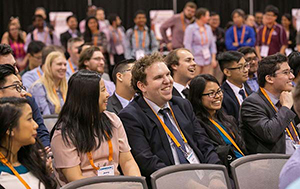 For the second year, NACE International will host an interactive Leadership Forum during CORROSION 2019. Scheduled for Monday, March 25, from 8 to 11:30 a.m., followed by a luncheon, Bridging the Gap with Effective Leadership will provide the opportunity for attendees to learn from those who set the direction of their businesses and use their management skills to effectively guide teams to reach organizational goals. Participants will gain valuable insights and leadership skills that will enhance their personal and professional lives. Forum Chairs Laura Cardenas of Lloyds Register and John Todd of KTA Tator will provide opening remarks, followed by the first session,“Letting your Experts Retire, But Not Their Expertise.” The speakers are Dynisha Klugh, director of Learning Technologies and Curriculum Development,Nalco Champion; and Cindy Hubert, executive director of Client Solutions, APQC. Beginning at 9:15 a.m., the second session, “Cultivating Seeds for SUCCESSion,” will be led by Terry May, president of MESA. After a brief break, the third session, “Lifecycles of Leadership,” will features speakers Justin Daarud, director of Americas Operations, Lloyd’s Register’s Asset Integrity and Maintenance Optimization; Bernardo Duran, manager of Technology and Market Development, International Zinc Association; and Khairol Anuar Shukri, director of Group Technical Solutions, Petronas, Kuala Lumpur. Attendees are then invited to the Leadership Luncheon to continue learning more on how to become an effective leader. They will hear from Cathy Leslie, executive director of Engineers Without Borders, who has overseen growth of the organization from a single university chapter to 288 student and professional chapters. Nearly 17,000 volunteers work in more than 40 countries to implement engineering projects to provide clean water,sanitation, access to health facilities, renewable energy, and more. The cost is $50 to attend the luncheon. The Leadership Forum and luncheon will both be held in Grand Ballroom A2 at the Nashville Music City Center. As NACE International wraps up its 74th annual conference, corrosion professionals from around the world continued the momentum started by the 11 founding members in 1943 when almost 6,000 attendees from nearly 70 countries worldwide came together at the Nashville Music City Center and other area venues for CORROSION 2019.